There's a thing that's happening. I think mango is the pumpkin spice of the summer at Trader Joe's. If you forgot already, last fall was like a psycho spicy pumpkin apocalypse. They had pumpkin spice tea, breakfast bars, toaster pastries + tortilla chips, even. OK.
Now Trader Joe's has chocolate covered mango, mango oatmeal, mango coconut popcorn + the list goes on. So here's a fresher take on mango, because they're good, not because they're trendy. Thinly slice fresh mango + then you can fill it with whatever you want. For this you'll use mango as a wrapper for lime + parsley-filled crab. Then chow down. Start by prepping the filling. Gently toss the crab meat with the lime juice + parsley. Taste + season with salt + pepper. Set aside. 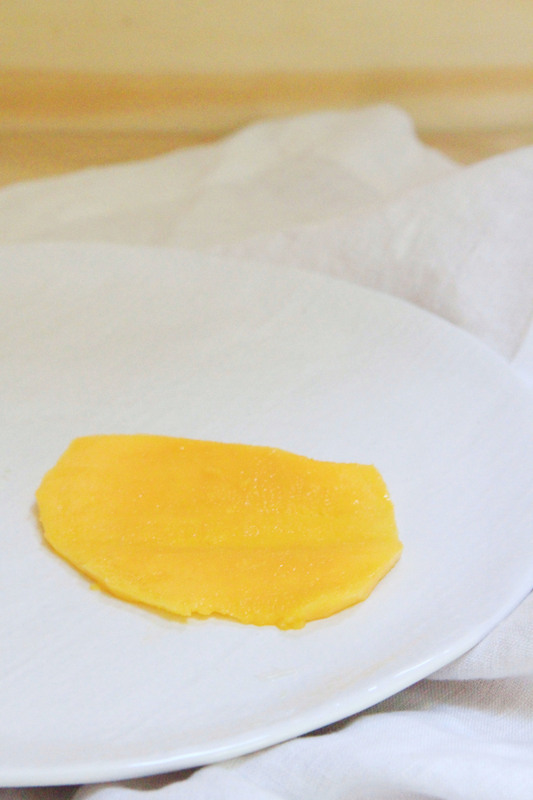 Peel the mango, then thinly slice pieces from the mango to form "wrappers". To serve, top each mango slice with two slices of avocado. Add a large spoonful of the crab mixture. Use a toothpick to form the mango into a taco shell shape. Devour.